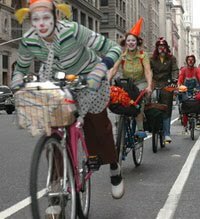 Bike Clowns (literally) join in fight for Brooklyn bike lanes | Hipsters and Hassids: The painting series. The phenomenon. “The controversy—removing, repainting, arrests, etc.—over a 14-block stretch of the Bedford Avenue bike lane has reached the absurd heights we’ve been hoping for: The clowns are coming. The Bike Clowns, that is, the nattily attired brigade of bike lane defenders that really hates it when you mess with their preferred mode of transport. According to a press release, the clowns will have a “New Orleans-style funeral procession followed by a vigil” on Sunday at 2 p.m. for the missing bike lane. Given the hubbub over the Hipsters vs. Hasids bike battle in South Williamsburg, expect many a camera. Meanwhile, the Post reports that a group of Brooklyn environmental activists plan to seek out Mayor Bloomberg in Copenhagen next week to give him an earful on the issue. It’s a good thing they put in that transatlantic bike lane!